This custom CM Series is designed for modern paint stripping that replaces methylene chloride. The system pictured below has a 375 gallon capacity and can handle a 45″L x 30″W x 30″H volumetric load weighing up to 500 pounds. Other sizes are available for loads up to 2000 pounds. 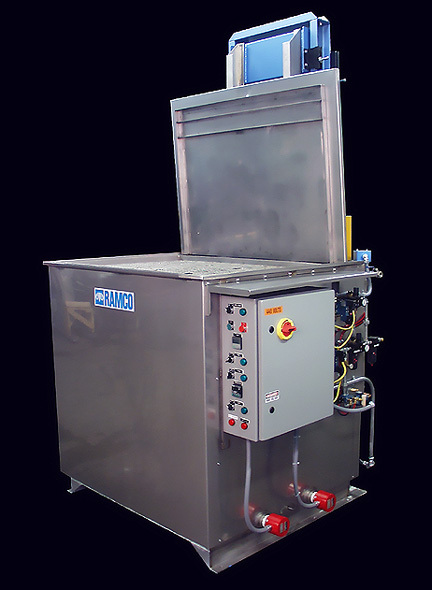 RAMCO Equipment custom CM Series Industrial Parts Washer – Paint Stripping System. The system is built of heavy gauge stainless steel with exterior stainless steel insulation panels. A Nema 4 rated electrical enclosure includes selector switches, pilot lights, digital indicating temperature controller, digital cycle timer and lockout-tagout disconnect switch. An automatic opening and closing cover is included to reduce fumes and save on energy. 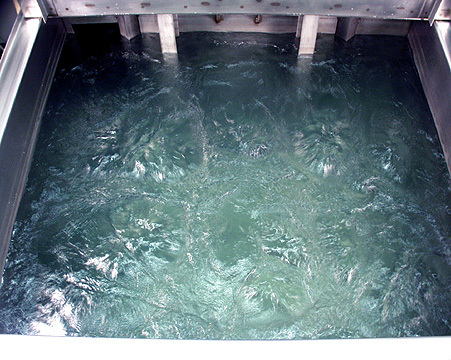 RAMCO industrial parts washer engineered high turbulation of paint stripping chemicals. The system is engineered for high turbulence of the paint stripping chemical. Multiple jets are employed within the processing chamber, directed at the working zone, to activate and enhance the chemical activity. A vertical immersion pump is used eliminating potential seal problems.